Be it calling, texting, clicking photographs, playing music or locating directions, there is approximately nothing that any handheld electronic gadget cannot accomplish in the present day. Though the use of many of such gadgets is not allowed in the classroom for obvious reasons, but there is certainly no denying of the fact that these gadgets offer innumerable benefits, even for our children. Mentioned below are 6 gadgets that offer fun, intuitive and experiential learning! You can now boost the overall learning experience of your baby right from the very start. 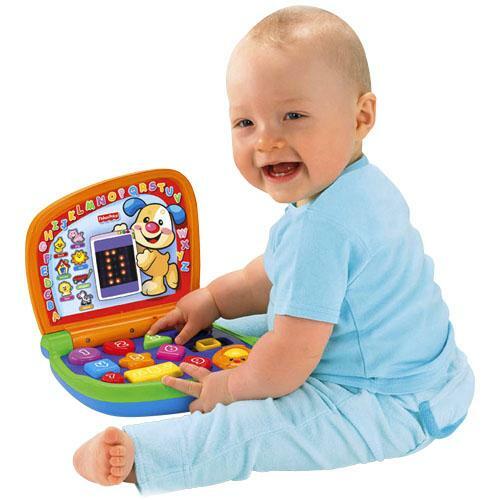 The Fisher Price Laugh & Learn Smart Screen Laptop is best described as the “baby-appropriate laptop” that adorns a colorful keyboard with 9 easy-to-press keys. This baby laptop captivatingly animates numbers, colors, shapes, alphabetical letters and various object names which are displayed on its screen along with many other activities including sing-along songs. This smart-screen laptop is bilingual and as such you can carry forward with your tot’s learning process in either English or in Spanish. Help your rugrat better explore the earth with his childhood best friend Alphie. Providing a background to their robot, Playskool describes Alphie as a lovable robot who has landed on earth from his home planet. He is on a field trip to explore various details about our planet earth. Alphie teaches various lessons on letter sounds, cause and effect, shape sorting, vocabulary development and lots more. When it comes to some serious educational toys, VTech MobiGo seems to be a class apart in the market. This fun gadget looks somewhat like a QWERTY mobile device, which enables your child to play around with fun yet educational games. Its various applications include English vocabulary, various spellings, fun mathematics and so much more. This handheld customized gaming system is sure to appeal kids below eight years of age. Disguised as a simple toy, Mindflex is a game that allows your kids to control the up and down movements of the ball that is suspended in the air by genuine flexing of their brain. Your kids are required to concentrate hard on the ball such that it moves between various hurdles within the game. With constant practice the game will help to tone the muscle of your children’s brain. This is one best way to teach your children the true power of their brain that too at very young age! The robotic Hexbug Nano Bugs are so programmed so as to behave like original bugs. The moment you switch on the micro insect, it instantly springs up to life and scurries all across the floor. As soon as the bug encounters any obstacle, their self righting mechanism makes them move in another direction and they even have the potential to flip back over if they happen to topple on their back. These Hexbugs not only satisfy your child’s desire for creepy crawlies but also helps them to build their very own designs and habits and can even share them online. VTech V.Reader is one of the best selling e-reader specially designed for children who are new to reading. It’s time to make learning fun while polishing the reading skills of your kid with this amazing, fun and interactive e-reading system. This system offers comprehensive building blocks for all the kids to develop from a beginner into a well-versed and fluent reader as they read along various phonics, comprehensions, word-building, and vocabulary along with the definitions that are simple to follow. Your child is going to love this overall learning experience. Lim Chuwei is an English language teacher. Well versed with the latest e-learning technologies and nuances of teaching a foreign language, he’s now working with ChampionTutor to change the scope of language education in the country. Read my Blog || Facebook.